How many hands did Mrs. Smith shake at the party she attended with her husband and 4 other married couples? Mr. and Mrs. Smith attended a party with 4 other married couples. Various handshakes took place. No one shook hands with themselves, or their spouse, or with the same person more than once. After the handshakes were over, Mr. Smith asked each person how many hands they shook. Every one, including Mrs. Smith, had a different answer. How many hands did Mrs. Smith shake? Hints: Although this sounds difficult, you can reason this out and figure out. 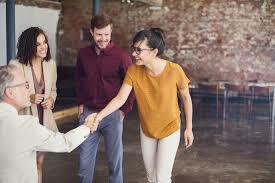 Start with identifying the minimum and maximum number of handshakes a person can make. After this, look at the handshakes made the person who made the highest number of handshakes. What can you conclude about the handshakes made by this person's spouse?